MIAMI, Oct. 14, 2014 – Sailing aboard the world’s largest and most exciting cruise ships will now come with even more bragging rights. Royal Caribbean’s Oasis of the Seas emerges from a 14-day drydock today with a new look including reimagined dining, game-changing high-speed internet, exciting new retail offerings, a new popular and favorite Broadway show, new suites with exclusive suite dining and lounge. Sistership Allure of the Seas will follow suit in May 2015 with nearly identical enhancements. During their respective drydock, each ship’s seven neighborhoods will be enhanced as part of the cruises line’s Royal Advantage commitment to deliver the best vacation offerings and to introduce guests to even more new features and personalized experiences that can only be found when sailing with Royal Caribbean. A key element of any vacation, dining provides vacation-goers with the opportunity to experience new flavors and indulge in old favorites. Royal Caribbean’s Dynamic Dining, allows guests to tempt their taste buds with more choice and flexibility than ever before by offering guests a landscape of 20 restaurants, as vast and varied as dining in the world’s most cosmopolitan cities. The Grande, where every night is formal night, offers an elegant ambiance and refined cuisine. Guests will enjoy menus of the new concepts beginning March 14, 2015, onboard Oasis of the Seas. Guests sailing Oasis of the Seas prior to March 14, will enjoy the traditional dining room experience in the newly designed spaces. Coastal Kitchen is an exclusive restaurant for suite guests and Pinnacle members, that fuses Mediterranean influences with the unmatched riches of California’s bountiful farmlands and features. The experience is complemented by a robust wine list, curated specifically for the venue. Finally guests will continue to enjoy Giovanni’s Table, 150 Central Park and Vintage Wine Bar, the hugely successful specialty dining concepts introduced on the Oasis-class in 2009. Boatloads of Bandwidth, the game-changing partnership with technology partner O3b that will offer guests onboard Oasis of the Seas and Allure of the Seas connectivity that matches fast broadband connections onshore and is greater than all other cruise ships combined. These new capabilities, allow the cruise line to offer affordable, easy-to-use Internet packages so that guests may watch streaming video, check email, share images on social media and enjoy face-to-face video conversations – even in the middle of the ocean. Royal iQ is a new app that puts guests in charge of their vacation choices. Thanks to the dramatically improved connectivity, Royal iQ is able to continue dining reservations, shore excursions and spa appointments onboard, through both a downloadable app and at freestanding iQ stations around the ship. Guests also can use Royal iQ as a convenient calendar that provides at-a-glance views of their program and to keep in touch with one another and home via phone and text capabilities. Coastal Kitchen is a suites only full-service restaurant offering breakfast, lunch and dinner with a Mediterranean flare. Oasis of the Seas’ introduced the first-ever, fully-licensed Broadway show at sea and now, the ship will bring one of the longest running productions on Broadway, Andrew Lloyd Webber’s Tony award winning CATS to sea for the first time. Beginning June 2015, sister ship Allure of the Seas will feature MAMMA MIA!, the smash hit musical based on the story-telling magic of ABBA’s timeless songs. Known for its first at sea offerings, Royal Caribbean is introducing the playfully sophisticated designs of kate spade new york to Oasis-class on its popular Royal Promenade, a first at sea. Rounding out the diverse onboard shopping are two guest favorites Michael Kors and the Britto Art Gallery, as well as a whole new line-up of merchandise and fashion jewelry such as, Alexis Bittar, Uno de 50, Lauren G Adams, and Nina Nguyen. These enhancements take many of the best features the cruise line has created in recent years and introduces them to its newest ships, by building on Royal Caribbean’s best-in-class global vacation offering and delivering to guests the Royal Advantage – the industry’s most innovative cruise ships, combined with exciting itineraries and destinations, and world-renowned friendly and engaging Gold Anchor Service. More information on specific roll out dates for Oasis-class ships is available at: www.RoyalCaribbean.com. Oasis of the Seas and Allure of the Seas sail alternating seven-night Western and Eastern Caribbean itineraries every Saturday and Sunday, respectively from Fort Laurderdale, Fla., visiting exciting warm-weather getaways in the Caribbean. During the 2015 Europe season, Allure of the Seas will be homeported at Barcelona, Spain, for the first full Oasis-class Europe season. Media can find more details, images and videos at www.RoyalCaribbeanPressCenter. com. See it here!!! Louis Bloom, President of Gem Casino Travel, was literally knocked off his feet when 200+ of his dearest friends and family yelled SURPRISE” as he entered an Atlantic City ballroom in one of the many luxury gaming properties Gem Casino Travel represents. As you will see in the video, when Louis opened the door, the roar of “Surprise” literally knocked him on his A$$!!! To top the night, Larry Holmes, the “Easton Assassin”, hosted a ROAST of Louis! If you know Louis well, you would understand, Louis has never been caught off guard before. MIAMI – January 13, 2014 — Norwegian Cruise Line today introduced an all-new way for guests to have access to one of Norwegian’s specialty restaurants every night of their cruise. 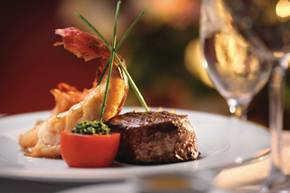 Called “Norwegian’s Ultimate Dining Package,” this new program provides the opportunity for guests to experience each of the line’s most popular specialty restaurants including Cagney’s, the line’s signature steakhouse; French bistro, Italian restaurant, Moderno Churrascaria, Asian-Fusion Restaurant and more*, at a special rate based on the length of the cruise. The package is currently available on all Norwegian ships fleet wide. The Ultimate Dining Package gives guests the opportunity to have a taste of something deliciously new every night of their cruise when they experience the array of specialty restaurants found on board Norwegian ships. Diners will delight in Norwegian’s signature steakhouse, featuring succulent grilled steaks, perfectly cooked double cut lamb chops and other delectable steakhouse favorites. Another one of Norwegian’s signature specialty restaurants is the French bistro, where guests will enjoy French favorites such as escargot, coq au vin and a spectacular vanilla crème brulee for dessert. Guests will also love dining in Norwegian’s traditional Italian restaurant, where they can feast on a variety of pastas, made-to-order specialty pizzas, and other Italian favorites such as chicken parmesan and osso bucco in a casual atmosphere. At Norwegian’s Asian Fusion restaurant, guests can experience the flavors of the far east including Japanese Teppanyaki, Chinese or Pan-Asian Cuisine. Meat lovers will delight in the opportunity to dine in Moderno Churrascaria, where unlimited servings of succulent Brazilian barbeque are served tableside by Norwegian’s own passadores. Norwegian’s Ultimate Dining Package is available in tiers based on cruise length. On three to six day voyages, guests can dine anywhere throughout their cruise at a set price of $59 per person; for seven-day voyages, the package is $119 per person; $149 per person on eight to 10 day cruises; $199 per person for cruises of 10 to 15 days; $259 per person during cruises of 16 days to 25 days; $299 per person during cruises of 26 days to 35 days and $349 per person during cruises of 36 days to 45 days. 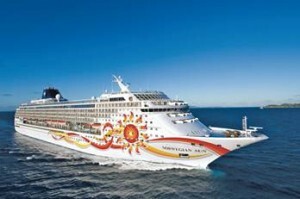 To take advantage of the Ultimate Dining Package, guests with a current cruise reservation can either pre-purchase the package by logging into their “myncl” account on www.ncl.com, by contacting Norwegian reservations at 888-NCL-CRUISE or by purchasing the package on board during the first or second day of their cruise. MIAMI – December 12, 2013 – Norwegian Cruise Line has added another element of luxury to the line’s array of exclusive suite amenities by introducing a new, first of its kind in the cruise industry “Bath Butler” menu, offering guests the opportunity to pamper themselves with one of the line’s signature baths, which are drawn by the suite guest’s dedicated certified butler. The butler baths are listed on an in-suite menu and available in all suites fleet wide, including those in the Haven by Norwegian, the line’s exclusive ship-within-in-a-ship suite complex. Norwegian Getaway will offer families the ultimate vacation experience as the line announced that Nickelodeon®, the number-one entertainment brand for kids, will have a presence on its newest ship, Norwegian Getaway, when it sets sail from Miami beginning February 1, 2014. Guests sailing on Norwegian Getaway will have the opportunity to cruise with SpongeBob SquarePants, Patrick Star, Dora the Explorer and Diego, among other favorite Nickelodeon characters; as well as participate in a variety of exciting interactive Nickelodeon experiences. Norwegian Getaway will include some of the popular family events, shows and activities that guests enjoy on Norwegian Jewel, Norwegian Gem, Norwegian Epic and soon Norwegian Breakaway, including “Name that Game” an exciting brand-new experience that will debut on Norwegian Breakaway. Norwegian Getaway will be the fifth Norwegian ship to offer Nickelodeon experiences, and will offer the latest in Nickelodeon activities and events that kids of all ages will enjoy. Following its premier on Norwegian Breakaway, Norwegian Getaway will offer families the opportunity to experience the all-new “Name that Game,” an exciting combination of trivia, speed, skill and slime, where participants will hit the buzzer, race the clock and get extreme as they experience the best of Nickelodeon’s famous game shows live on one stage. Norwegian Getaway will also feature the popular Nickelodeon Pajama Jam, where kids have the opportunity to enjoy an action-packed breakfast experience with their favorite Nickelodeon Characters; Dora’s Dance Party, where kids will have the chance to sing and dance to their favorite songs with Dora the Explorer and Team Nick; Nickelodeon Character Meet and Greets; Story Time with Dora; and Nickelodeon Arts and Crafts. 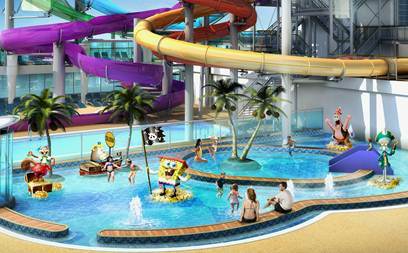 The line also announced that the ship will feature an all new pirate-themed Nickelodeon Kids’ Aqua Park where children can cool off with colorful, whimsical and larger than life Nickelodeon characters from Bikini Bottom, including SpongeBob SquarePants, Patrick Star, Squidward and more. The area will include a kid-sized pool and slide, along with multiple water features that squirt and shower guests with delight. Nickelodeon characters and themed activities will also be featured in Splash Academy, the ship’s youth area offering merriment for kids ages three to 12. Like her sister-ship, Norwegian Breakaway, Norwegian Getaway features a centrally-located Splash Academy complex that spans two decks, 12 and 13. It is also adjacent and easily accessible to the ship’s family-friendly staterooms. The reception area, located on Deck 12, is in close proximity to the forward elevators. As parents enter, they will utilize Norwegian’s e-Youth tablet-based electronic registration which allows them to swipe their keycard and input a password to sign in their children. Just past the brightly-colored and welcoming reception area, the three to five year olds will have their own space decorated with vibrant, engaging colors along with child-sized furniture. Wall mounted activities will keep little hands busy in between organized programming. In a separate area decorated with fun graphics to captivate children’s imaginations, the six to nine year olds will enjoy building block activity centers. An interactive dance mat with corresponding large video screen will encourage lots of activity. In addition, a dedicated space houses popular video game stations, along with a relaxing video viewing lounge. On Norwegian Getaway, children ages 10 to 12 years old will have their own space on deck 13. It will include a multipurpose visual dance space with a touch screen jukebox, plenty of moveable tables for activities and comfortable bean bags for lounging. An activity zone will include everything needed for arts and crafts and more. There is also a “hang out” area with dedicated gaming stations that will feature the latest video games. Rounding out the space will be a cool and comfortable lounge area with sofas and chairs in vibrant colors creating the perfect atmosphere to chill out. Entourage, located on Deck 16, is Norwegian Getaway’s high energy, exclusive teen zone for ages 13 through 17. This hip, sophisticated area was designed to give teens their own funky space that includes air hockey; foosball; and an arcade center with five separate areas featuring large screens to play the latest video games while lounging on comfy sofas. In the evening, Entourage transitions into a teens-only nightclub with a dance floor, large screen television and music, including a video jukebox. Entourage has the advantage of being located next to the video arcade and a step away from an outdoor eatery and refreshment area to round out the teens’ experience. GRAMMY winners and nominees, among others. The ship will also feature an all-new dining and entertainment experience, The Illusionarium. A first of its kind at sea, The Illusionarium will envelop guests in the fascinating world of magic, inviting them to experience the astonishing illusions of world-class magicians and supernatural special effects. In addition, every Norwegian Getaway sailing will feature a dazzling fireworks show. To celebrate the excitement of Nickelodeon’s presence on board Norwegian’s newest ships and to give families to get a taste of what it means to cruise like a Norwegian, Norwegian Cruise Line, in partnership with Nickelodeon, is hosting a party in New York City. Norwegian invites families and kids of all ages to join them in Grand Central Terminal’s Vanderbilt Hall on Saturday, April 27, 2013 for a day of family fun. Families who stop by the free event between 11:00am-5:00pm will have the opportunity to play a variety of interactive games and activities, enjoy surprise Nickelodeon character appearances, win prizes and much more. 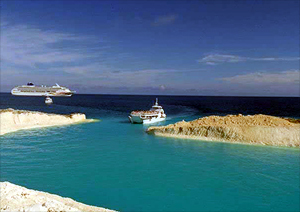 Norwegian Getaway will sail seven-day cruises from Miami to the Eastern Caribbean beginning on February 1, 2014, with ports of call including Philipsburg, St. Maarten; St. Thomas, U.S. Virgin Islands; and Nassau, Bahamas. This is the home of turning it up loud with the hottest Casino in the Dominican Republic. You’ll always find the best action in the Carribean in our 45,000-square-foot Casino. We have over 450 of your favorite slot machines in all denominations. The excitement of our table games is legendary with over 40 different tables, from the international flavor of our Poker room to the pulsating energy of Blackjack, Craps, Roulette and Baccarat, you will find tons of action day or night. If you are a high roller, visit our Salon Prive VIP area where you will find high limit Baccarat, American Roulette, Blackjack, and Sean Connery. Well, maybe. As of December 1, 2010, Allure of the Seas is the first to welcome the DreamWorks Experience onboard our already stunning collection of experiences for the whole family. Allure of the Seas will be the exclusive ship in our fleet with the How to Train Your Dragon™ Ice Show and Madagascar™ Aqua Show.